A group of businessmen with ties to Eastern Canada would like to make the Canadian Football League’s dream of a tenth franchise come true in Halifax. The group made a presentation to the league’s board of governors several weeks ago in Toronto. Meetings have since taken place with various levels of government in Nova Scotia, including an in-camera session with Halifax city council this week that was attended by CFL commissioner Randy Ambrosie. “We have had discussions with the CFL’s board of governors and ongoing discussions with commissioner Ambrosie,” said Anthony LeBlanc, a partner in the group and former president and CEO of the NHL’s Arizona Coyotes. Along with LeBlanc, whose family is from New Brunswick and who began his business career in the province, the group includes Bruce Bowser, a Halifax native who is currently president of AMJ Campbell Van Lines, and Gary Drummond, a businessman from Regina who was president of hockey operations for the Coyotes. A league spokesman confirmed it had received an expression of interest for a Halifax franchise but said that a process and timetable for awarding a team has yet to be established. The Halifax group is modelling its plan on that of the Ottawa Sports and Entertainment Group, which received a conditional franchise from the CFL in 2008 and then redeveloped Frank Clair Stadium and the land surrounding it. It’s believed the Halifax group would like to have a conditional franchise granted before the start of the 2018 CFL season, with a goal of beginning play as soon as 2020. The potential owners want to brand the franchise to identity not just with Halifax but all of Atlantic Canada. 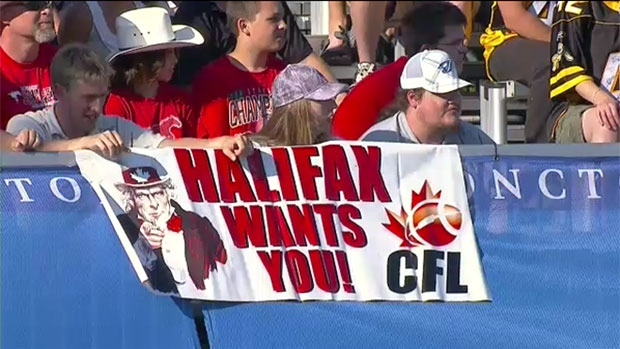 Halifax mayor Mike Savage has been on record as saying he would like to see his city host a CFL franchise. Sources say discussions with Savage and members of his council have been very positive over the past few months. Central to the idea is the construction of a multi-purpose stadium, at one of several locations currently being explored – one of which is the Shannon Park, located next to the A. Murray MacKay Bridge. Commissioner Ambrosie is expected to update the league’s board of governors on the state of the Halifax proposal when they meet the day before Grey Cup Sunday. Besides expanding the league’s television footprint into Atlantic Canada, a Halifax-based franchise would allow the league to create two five-team divisions and avoid the number of bye weeks required with a nine-team league. The CFL awarded a conditional franchise to a Halifax group in 1982 under the name Atlantic Schooners but the financing to build a suitable stadium never materialized. Dating back to the mid-1980s, the CFL has staged exhibition games in Halifax. In 2010, 2011 and 2013 it played three regular-season games in Moncton, N.B.